South Korean President Moon Jae-In (R) talks with North Korean leader Kim Jong-Un (L) at the Peace House on the Joint Security Area (JSA) on the Demilitarized Zone (DMZ) in the border village of Panmunjom in Paju, South Korea, on Friday. Photo courtesy of Inter-Korean Summit Press Corps. North Korean leader Kim Jong Un said he is "not the kind of person who will shoot nuclear missiles at the South, the Pacific or the United States, promising that he initiate a "verifiable" shut down of the main Punggyeri nuclear facility. South Korean presidential official Yoon Young-chan on Sunday briefed reporters on Kim and President Moon's conversations throughout their historic meeting, the first inter-Korean summit to take place in eleven years, E Today reported. Kim is said to have told Moon that "the United States has objections toward the North's regime, but if it [the U.S.] tries talking with the North, it would see he would not the type of person who would fire nuclear arms or even possess them "if there is trust." The North, last year, threated that the U.S. territory of Guam and the U.S. mainland were well within the reach of its nuclear strike. It threatened to turn the U.S. "into a sea of fire," after a fresh round of United Nations sanctions imposed on the North in August, and made a similar warning regarding Seoul, after the South conducted a military exercise. The North, however, declared a moratorium on nuclear and missile testing and said it would shut down the Punggyeri nuclear test site, ahead of its summit with the South. "If we meet frequently and build trust with the United States and promise an end to war and non-aggression, why would we live difficultly by possessing nuclear weapons?" he reportedly said to Moon on Friday. Kim also shot down speculations that the North decided to shut down the Punggyeri facility as it was largely worn out, after six rounds of nuclear tests, No Cut News reported. "You'd know if you came and saw it, but it is in excellent condition with two mine shafts that are bigger than the initial test facility," Kim said. He promised to shut down the test site in May and "transparently reveal it to the international community." "We will soon invite experts and journalists from the South and the United Sates, he said. 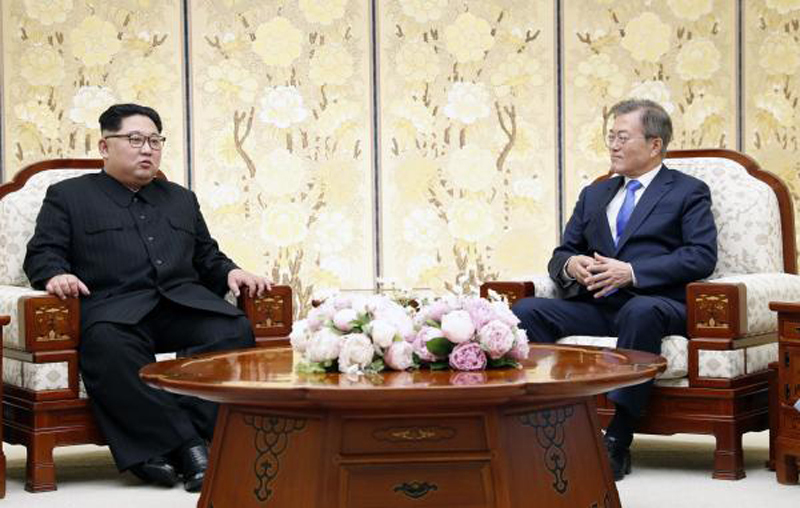 Moon and Kim on Friday signed and announced the historic Panmunjom Agreement, named after the border village that they held their summit talks. The two Koreas agreed to pursue a full denuclearization of the Korean Peninsula and the ending of war through a peace treaty. More intensive talks on denuclearization are expected between Kim and U.S. President Donald Trump in their upcoming summit meeting.